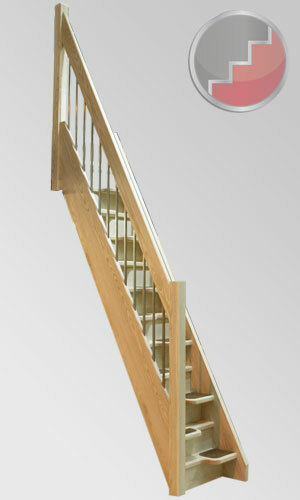 The Stairplan Ash 40 compact loft space saver staircase is a solid, quality spacesaver staircase. With its light colour and attractive grain, the Ash 40 is an ideal staircase for locations where the timber will enhance the decor. The natural shock absorbing properties of ash add to the quality of this impressive spacesaver staircase. Designed with recessed 40mm ash treads, 40mm ash strings and 9mm ash veneered risers, this superb quality spacesaver staircase will enhance any home. The Ash 40 spacesaver staircase can be supplied with either one or two Traditional or European style balusters (with handrails) and carpet inserts as optional extras. (Handrails and inserts must be ordered before production commences). This staircase is also available in an openplan configuration. The staircase can be delivered fully assembled or flat packed and can be manufactured in any width up to 800mm with up to 16 risers. 90° landing turns are available as a bespoke feature on the Ash 40 spacesaver staircase range. For a quotation on this staircase or find out more, fill in the form below below or give one of our sales advisors a call on 01952 608853 to place an order.